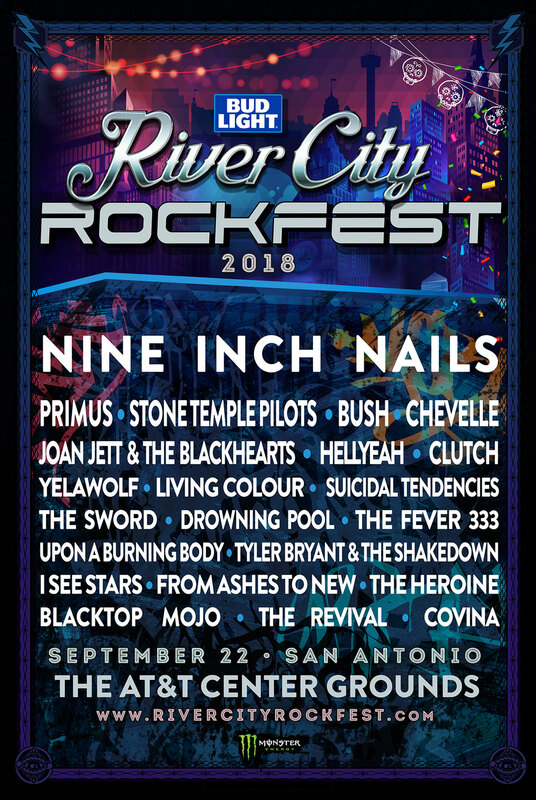 The Bud Light River City Rockfest returns for its sixth year with a massive rock lineup Saturday, September 22 at The AT&T Center Grounds in San Antonio, Texas. South Texas' only rock festival will feature a headlining performance from Nine Inch Nails, and will also feature Primus, Stone Temple Pilots, Bush, Chevelle, Joan Jett & The Blackhearts, Clutch, Hellyeah, Suicidal Tendencies, and many more on three stages. You can purchase tickets at rivercityrockfest.com/tickets with several packages and discounts available: general admission, groupie, roadie, 4-pack, and military.